This sort of reminds me of both loco moco and Eggs Benedict. It has the comfort-food spirit of loco moco but the eggs have a more Benedictine texture. Best of all, it can be made in about 30 minutes, including prep, which neither of them can boast. Cooking time varies by a few minutes, depending on how 'done' you like your egg yolks. The recipe below is really more about proportions of ingredients. 6-7 will make dinner for a hungry family of 4 if you add bread and salad. Or cut fruit while they bake for a fancy-looking breakfast that looks like you spent way more time than you did. Preheat the oven to 375 degrees. Spray a muffin tin with Pam. Quarter the cherry tomatoes. Stuff individual muffin spaces with the ham slices to form a basic cupcake line. It will be curvy, but that will make it look prettier as it bakes. Spoon a bit of pesto, no more than 1/4t into the bottom of each ham cup. Crack one egg into a small bowl and then pour it into the ham cup. Do not try to crack the egg and then pour it directly into the ham cup. The curves created by the ham slice render this physically impossible. Repeat for as many ham cups as you are making. Do not be lazy and crack the eggs all at once into a big bowl either. This really doesn't take much time. Break provolone into small pieces and tuck them in around each egg. Tuck in the quartered tomatoes. Fill any empty muffin spaces with water. 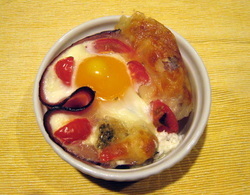 Bake for about 20 minutes if you want a soft-set yolk, 25 minutes if you want a hard-set yolk. The cheese will start to bubble and turn golden brown.